Have an interest in fossils or history and want to get involved? 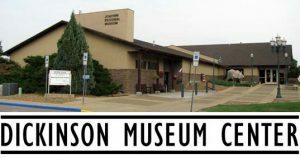 VOLUNTEER at Dickinson Museum Center. Working in various capacities our volunteers support our missions with their time and talents, giving back to their community and, we hope, enjoying helping bring the stories of our region to new audiences. 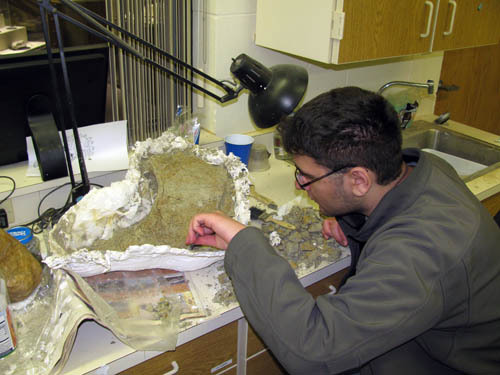 Collections and Laboratory volunteers work under the supervision of the Curatorial Staff (Paleontology or History) and assist with collections management tasks (scanning, cataloging, conservation and arrangement), laboratory work (cleaning dinosaur bones) as well as exhibit development. Visitor Services volunteers work as docents (interpretive tour guides) providing guided tours for groups large and assist with other programming as well as acting as greeters and receptionists. Special Events volunteers typically support special programs, celebrations, festivals, or any Museum Center event that is geared to raise the Center’s profile, and/or help generate operating or exhibit funds. Maintenance volunteers help maintain a safe and clean environment at the Museum Center. Working with the Museum Custodian these volunteers also assist with the fabrication of exhibits, and help maintain the Center’s buildings including its historic structures. Education Services volunteers work with the Museum’s Education Coordinator and/or Curators to assist with school groups, class presentations and children’s activities. Please call 701-456-6225, or email info@dickinsonmuseumcenter.com to inquire about Volunteer opportunities. 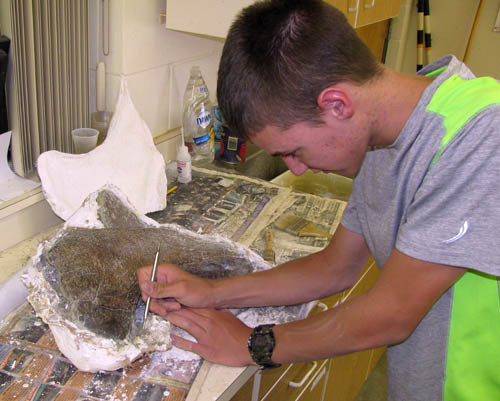 Volunteer in the dinosaur preparation lab! We need your help cleaning up our dinosaur bones! If you are interested in dinosaurs and want to get involved, then why not volunteer in our laboratory? Our available projects vary depending on what our fieldwork has recently uncovered, and your personal interest and ability. Projects range from simple scrubbing away of mud with a toothbrush, to fine preparation of delicate fossils using more technical tools. For people who don't like getting their hands dirty, we have many dinosaur bone "jigsaws" - broken specimens that need to be pieced back together by a jigsaw fanatic! It takes a lot of practice and especially patience to become skilled in fossil preparation. New volunteers are assigned a relatively simple first project, with following projects that are more complex, introducing new skills, equipment, or techniques. Volunteers should be age 15 or over, and need to be mature and able to work independently in a lab setting. We prefer that individual shifts are at least 2 hours, although exceptions can be made, especially for younger volunteers. If you are interested in volunteering then email denver.fowler@dickinsongov.com, call 701-456-6225 (museum front desk), or drop by the museum.